FILE - Bahrun Naim, left, attends his trial at Solo's District Court, Feb. 21, 2011 in this photo taken by Antara Foto. 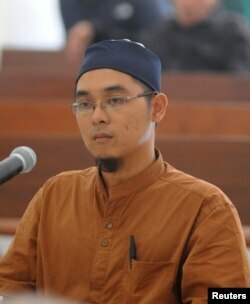 Naim was arrested on suspicion of involvement in a terrorism network in November 2010, and he was convicted in June 2011 of illegal possession of ammunition. One of Indonesia's most wanted men is a computer geek skilled at bomb-making who joined the Islamic State in Syria, where police say he now directs terror attacks against his native land. Indonesian authorities say they have linked Bahrun Naim to a string of terror attacks and plots to destabilize his homeland. He reportedly directs IS operations in Indonesia through the Telegram app favored by IS in Raqqa, which is the militant group's de facto capital in Syria, the officials said. On Friday, Indonesia’s anti-terror police said they arrested 11 suspected terrorists linked to Naim’s network. 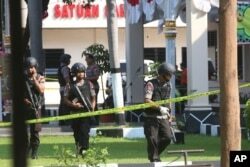 Police said the group had planned to attack the presidential palace in Jakarta. Naim, 33, was the alleged ringleader of a terror plot in Jakarta that was foiled over the weekend. Authorities said a female would-be suicide bomber and a suspected IS loyalist were arrested while planning to attack high-profile targets in the nation's capital. "They learned how to assemble a bomb from Bahrun Naim," police commissioner Awi Setiyono told reporters. Using social media channels and contacts in Indonesia, Naim has been actively recruiting people from Syria for terror activities and funds terror plots in the country, Indonesian police said. Authorities said they thought Naim was the leading coordinator for IS activities in Indonesia. "Bahrun Naim continuously tries to appeal to people in Indonesia, as well as in countries like Malaysia and Singapore, to carry out terror activities for IS," Sidney Jones, director of Institute for Policy Analysis of Conflict, a Jakarta-based research group, told VOA's Indonesian service. Naim has been tied to a number of attacks and failed terror plots in Indonesia this year, including a July suicide bombing in the Javanese city of Solo, police said. FILE - Members of a police bomb squad examine the area where a suicide bomber blew himself up at the local police headquarters in Solo, Central Java, Indonesia, July 5, 2016. Police said the bomber was a friend of Bahrun Naim, one of the hundreds of Indonesians with IS in Syria and who has been linked to other plots in Indonesia. He was identified as the mastermind of coordinated bomb and gun attacks in central Jakarta in January that killed eight people, including the four attackers. IS claimed responsibility for the incidents. Naim was also linked to a suspected militant arrested during a raid last month. Police said that during the raid, they found enough chemicals to build a bomb twice as powerful as the one used in the Bali bombing in 2002, which killed 202 people, according to Reuters. "On the orders of Bahrun Naim, they formed small cells and assembled bombs with other suspected militants," police commissioner Setiyono told reporters. Naim is known to be an expert in explosives, analyst Jones said. "He has written some sort of a guidebook containing instructions on how to make bombs," she added. According to media accounts, Naim was born in Central Java's Pekalongan city in 1983. He grew up in Solo, a city where radical groups have had a longtime presence, and graduated with a degree in computer technology in 2005. Naim was arrested on suspicion of involvement in a terrorism network in November 2010, and he was convicted in June 2011 of illegal possession of ammunition. The court, however, found insufficient evidence to pursue the terror charges, Indonesian authorities said. He fled the country in early 2015. Authorities tracked him to Syria, where they say he has continued strengthening his terrorist network in Indonesia. FILE - Bahrun Naim attends his trial at Solo's District Court, June 9, 2011, in this photo taken by Antara Foto. He was convicted on an ammunition possession charge. Police confirmed that Islamic State was responsible for an attack in Jakarta on Jan. 14, 2016, and named Naim as the mastermind behind it. Naim has used Telegram message channels to communicate with his network in Indonesia and has taught followers how to assemble explosives, Setiyono said. "Bahrun communicates also through Twitter and sends messages to people, not only in Indonesia but also in several other countries," Wawan Purwanto, an intelligence analyst at Indonesia's anti-terror agency, told VOA. "He [Naim] has a huge influence over his network. He brings new inspiration to his followers through social media," Purwanto said. "In fact, people are influenced by what he posts on social media." According to the BBC, Naim reportedly maintained a blog, portraying himself as a "freelance journalist." He has published posts on how to carry out terrorist attacks, make bombs and dodge surveillance. The blog also praised several attacks carried out by IS and its affiliates, the BBC reported. Attempts by VOA to access the blog found that it had been blocked. Islamic State remains a threat to Indonesia, the world's largest Muslim country, authorities said. As many as 384 Indonesians have joined IS, according to Indonesia's counterterrorism agency. Most of those have traveled to Syria and Iraq. Indonesian authorities last month said they were investigating the reported death in Iraq of a prominent IS commander from Indonesia, who was defending the militant stronghold of Mosul during a U.S.-backed military effort to dislodge the group. Andy Lala and Ahadian Utama of VOA's Indonesian service contributed to this report from Jakarta.